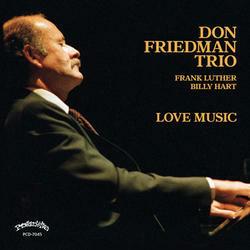 Pianist Don Friedman (1935-2016) was picked by Down Beat in the 1960s as a Talent Deserving Wider Recognition and he gathered a handful of their five-star reviews during that period. He had a fulfilling career, working regularly until shortly before his death. His discography includes a blinding number of recordings, but he was never as widely respected as he should have been. The session at hand (recorded 9/12/78 in New York) is a beautiful trio session and the tune selection is outstanding – classics like Smoke Gets in Your Eyes, Fine and Dandy, and Easy Living. Friedman has beautiful command of the keyboard, and enough imagination to wring the maximum effect from each performance.